The Sierras will strike back with a vengeance this week after last week left resorts there snowless. 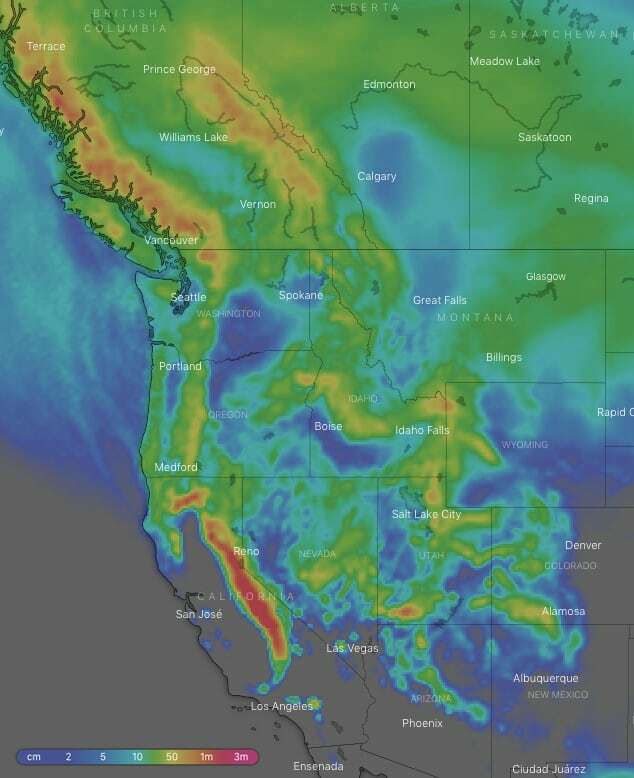 Ten-day snow accumulations show 1m-1.5m will fall along its main spine, with our high-resolution models picking 80+cm for Mammoth over the next seven days. Other mountain ranges will do well too, with accumulations mostly ranging between 30cm-75cm. This is all thanks to a doppelganger set of lows coming off the Pacific – one aimed at the Coast Mountains and the other at the Sierras. They both combine into a broad area of low pressure over the American northwest, setting up a west-wide storm, which we’re calling “Big Foot” and drops snow on all and sundry. Low pressure over Canada will see to it that snow will fall over more northern resorts throughout the day, with just sprinkles farther south until night when heavier falls get under way. High pressure elsewhere will keep things calm and settled, except in southern California where a teeny, tiny wee low skirts the coastline and gives resorts there a tickle-up with a dusting of snow up top but a rain shower down low. A low crosses Coast Mountains with snow continuing to fall over Canadian resorts from dusk till dawn with heavy accumulations on the cards. Another low will spin up just off northern California’s coastline, getting things fired up in the Sierras from late afternoon/evening with fair-dinkum heavy falls during the night as the snowline drops to base levels. The Cascades will be wedged between these two systems and precipitation will start there during the morning, but warm temps mean that it’ll be more wet than frozen. Heavy snowfalls in the Sierras will gradually ease to showers as temperatures continue to drop, while light to moderate falls gradually spread throughout the American Rockies, reaching Wyoming and Colorado at night. Snowfalls over Canadian resorts will ease to showers/flurries in the morning. Low pressure churning over the American northwest, or rather Big Foot, will see to it that most resorts in America and Canada receive light-moderate snowfalls, while heavy falls are possible in the northern Sierras, as well as Utah and Colorado during the morning. 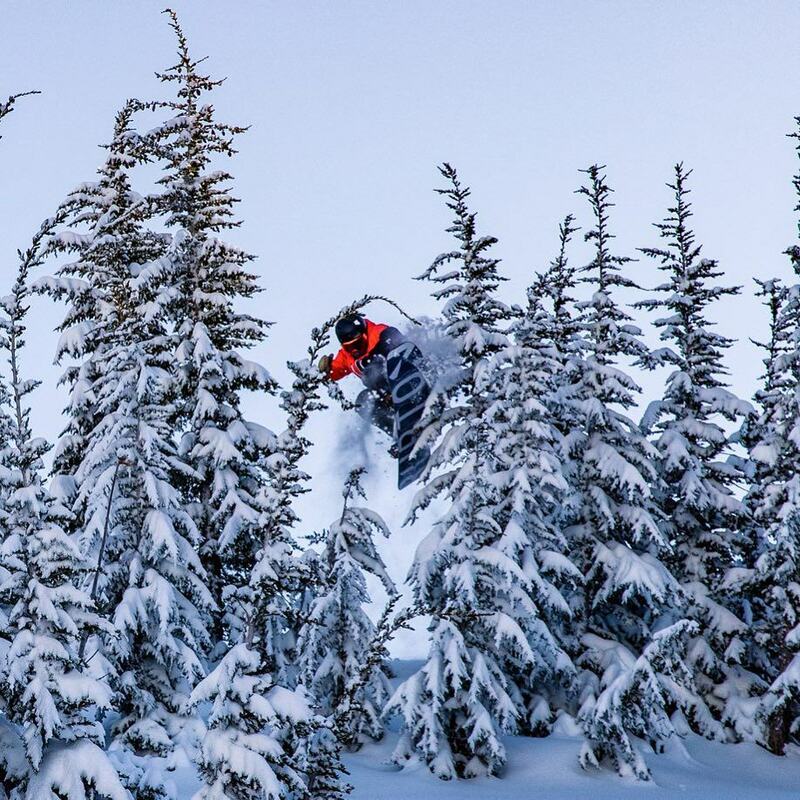 As Big Foot drifts southeast over the Rockies most resorts will receive light-moderate snowfalls, with heavier falls and chilly temps in the Sierras early morning while it clears the Coast Mountains of Canada. Snowfalls in the Rockies and Cascades become few and far between by the end of the day, with Colorado and Wyoming having decent falls first thing. There’ll only be a dawn flutter over the Sierras and the Coast Mountains should stay clear. Bye, bye Big Foot! A chilly start to a mostly fine and calm day. Remaining snow flurries in the Cascades and northern half of the Rockies will eventually clear as high pressure builds. High pressure looks set to dominate the following days with snowfall being restricted to the Coast Mountains and northern Cascades. There is, however, a suggestion we may see another low take a more southerly track over the Pacific with the Sierras set in its sights for possibly next weekend. The blizzard bells aren’t tolling yet though because storms of this type are notoriously unpredictable this far out, so check in next week for the update.